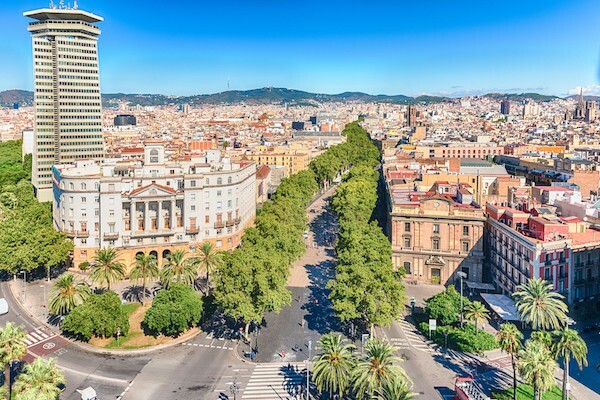 If you can spend as long as 4 days in Barcelona, you can bask in the city’s perpetual sunny weather, Catalan food delights, and balmy seaside. But Barcelona is more than just a fun hedonistic holiday. It has an exciting history, which is evident in its Roman ruins, elegant avenues of Modernist architecture, and colorful landmarks by architect Antoni Gaudí. As a resident of Barcelona, I’ve been lucky to enjoy the city at my own pace. But for first-timers who have less time, you’ll have to maximize your days. I’ve created this 4-day Barcelona itinerary for you – so you can marinate in all its glory. Read on…! Save money when you come here! Barcelona sightseeing can be really pricey. If you’re planning on seeing more than 5 Barcelona sights, consider buying a Barcelona tourist discount card. I highly recommend the Barcelona City Pass, which is 77.25€ (transaction fee included). It includes the Hop-On Hop-off Bus and the top things to see in Barcelona, including free entrance to the Sagrada Familia and Park Guell. It also includes a round-trip ticket using the Aerobus (normally 5.90€), the bus that takes you back and forth to the airport. You also get a 20% discount on La Pedrera (Casa Milà), Casa Batlló, Camp Nou, and MORE! In short, if you found the cheapest prices online for Hop-On Hop-Off Bus (27€), Sagrada Familia with audioguide (17€), Park Guell (8.50€), La Pedrera (22€), Casa Batlló (25€), it would be 99.5€. <– These are 2019 prices. And Barcelona City Pass is 77.25€! That’s a savings of over 22€. You can buy it through Ticketbar, which I’ve used to buy my own tickets to the Sagrada Familia. To buy your pass, you select the time that you’ll be in Barcelona. You purchase your ticket, then you pick the dates to see the attractions. And you DON’T have to print it out, you can just use your phone. For the most convenient place to stay, I suggest staying central like the Gothic Quarter or El Born. Check out my full neighborhood guide and places to stay! The first day is all about getting a feel for Barcelona’s vibe! The place to start is Ciutat Vella, or “Old City” of Barcelona. This includes Born, Gothic Quarter, Las Ramblas, and the Barceloneta. This area is packed with lots of Barcelona attractions, which may seem a lot to see in one day. But I promise it goes by quickly! It’s about 7 kilometers of walking – and it doesn’t mean rushing. It’s totally doable! Plaça Catalunya. Start here and walk down the famous pedestrian street called Las Ramblas. Stop and get a drink at the famous fountain “Font de Las Ramblas”. Legend has it that if you drink from here, you’ll fall in love with Barcelona and will come back. La Boqueria Market. It’s Barcelona’s most famous food market of hanging ham legs, carefully displayed exotic fruit, and rows of chocolate bonbons. It’s a good idea to head here in the morning as this place gets packed. It’s also polite to buy something while you browse, so I highly recommend one of the 2€ juices. You’ll feel superhealthy afterward! La Boqueria. 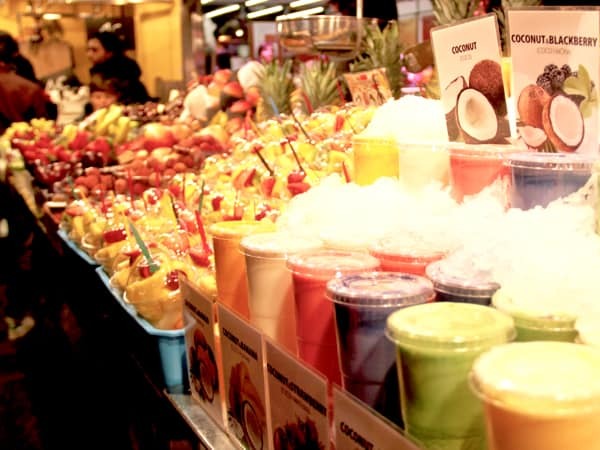 Get one of these juices to jumpstart your day of sightseeing! Plaça Reial. This is a large public square with porticoes, surrounded by bars and restaurants. It also has a central and iconic fountain and is always busy, day and night. Notice the light posts – they were designed by a young Antoni Gaudí! Christopher Columbus monument. This monument of the famous explorer marks the end of Las Ramblas. You can go up and get a view of the street and the sea! It’s 6 euros to go up, but it now and save 10%! Buy your Christopher Columbus monument tickets here. If you walk across the wooden bridge (Rambla de Mar), you’ll see the Maremagnum Shopping Center. It has all the basic Spanish shops and is the only shopping center open on Sundays. Plaça Sant Jaume. This is a popular square that was once a major square during ancient Roman times. It has the Barcelona City Council on one side, and the Palau de la Generalitat on the other. No need to hang out here long. If you’re hungry and want some cheap eats, head to Conesa (->click to see the menu <-). Locals and tourists both love it, so you may have to queue for a while. Plaça de Sant Felipe Neri. This somber and mysterious plaza has a haunting past. It’s where 42 people died during a raid ordered by dictator Francisco Franco. It has a beautiful fountain in the middle. Mercat de Santa Caterina is a food market that’s lesser known than La Boqueria. But it’s just also interesting and less tourist-centric. You won’t find so many out-of-Spain fruits or outlandish displays – mostly local goods. In fact, every single food market in Barcelona is fantastic because they all have a variety of foods. Basilica de Santa Maria del Mar. This mysterious church and is based on the famous book “Cathedral by the Sea”. 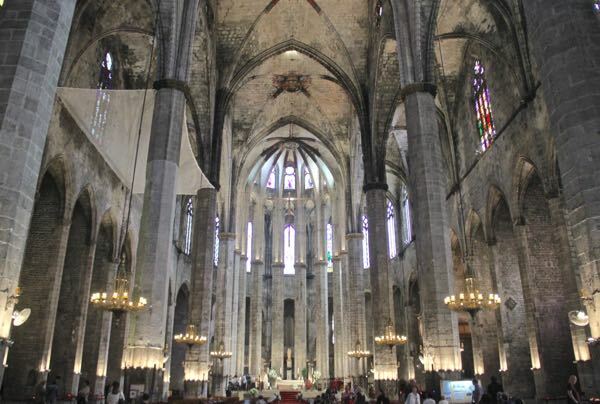 It was constructed in the 1400s and is more intriguing than the Barcelona Cathedral. This church was literally built by humans – no machines! Born Cultural Centre, is a glass and iron building and is formerly a food market. Now it’s a cultural center of events and workshops. In the middle are Roman ruins that you can tour as well. Ciutadella Park is the city’s central and largest urban park. You can spend all day here, lounging on the grass, visiting the Cascade, or even rowing boats in a small pond. It’s one of my favorite places to relax when I want to stay in the city and spend the day. Retreat here if you want to take a break! 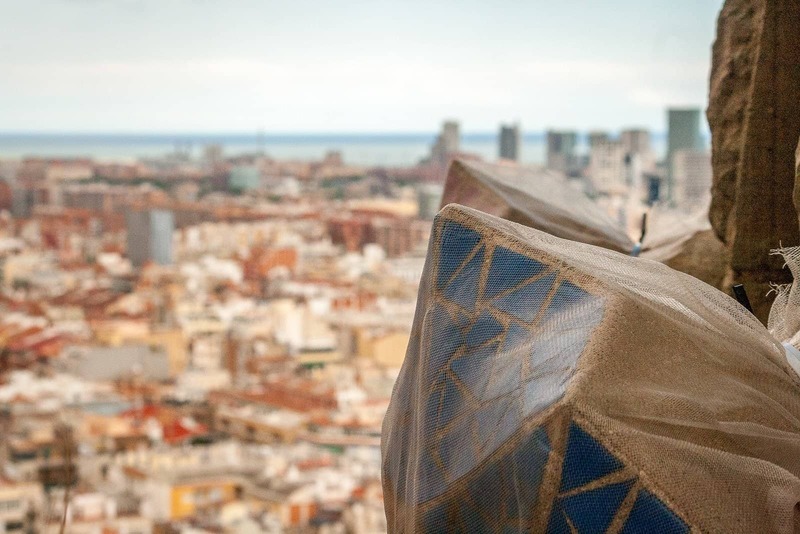 Climb the top of the arch once a year during 48h Open House Barcelona in October. MODERNIST BUILDINGS AND GAUDÍ. Today, soak in the city’s major heritage: the architecture! Sagrada Familia. It’s a no-brainer to go inside the Sagrada Familia. It’s one of Barcelona’s best attractions and the most popular in Spain. For that reason, I highly recommend that you buy your tickets ahead of time. Buy them here via Ticketbar) Expect to spend at least 2 hours. If you buy the “basic ticket” (see inside, no audioguide, no tour), new rules say that you can only enter after 2pm. I also highly recommend you at least do an audioguide – as you’ll learn how every detail of this church is VERY intentional. It’s enlightening and inspiring. A view of Barcelona from the towers of the Nativity facade. Teleferic, the Montjuic cable car. Get a bird’s eye view of the city. 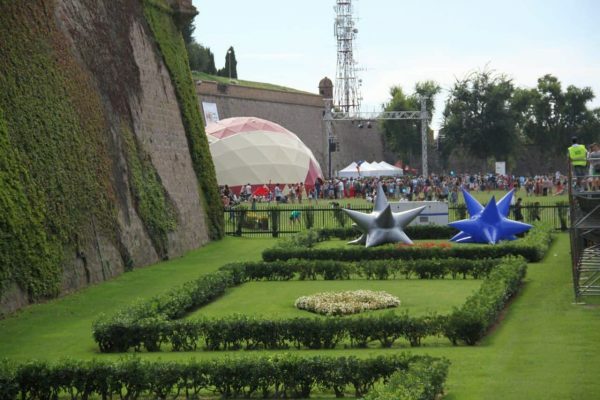 It has 3 stops: Parc Montjuic, Montjuic Castle, and Miramar. You can get off at any of these stops or do a round trip. Don’t expect to take any cool photos though, the glass was quite dirty when I went 🙁 (Buy your discount Teleferic tickets here for 11.43€.) Go to Martínez to get lunch and have a nice view of the city! Montjuic Castle. If you want to get another great view of Barcelona, head to this former military fortress dating back to the 16th century. Today, it’s used for events and random wandering and view-peeping. Montjuic Castle during La Mercè, Barcelona’s annual festival. The beaches. Barcelona has 4 kilometers of sand. (Fun fact: the beaches were “created” just for the 1992 Olympics. 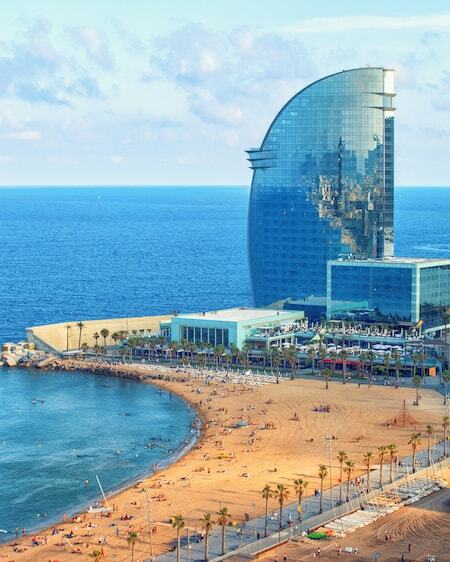 )The most popular beach in Barcelona is called La Barceloneta. It’s wild and atmospheric, and it’s the best beach with a stunning architectural backdrop of “El Peix” and the W Hotel. BUT, I don’t recommend hanging out here unless you want mojitos and crisps constantly hawked to you or want to see obnoxious bachelor parties in the middle of the day. Instead, try Mar Bella beach or San Sebastiá if you want to lay catch some rays. The beautiful W Hotel juts out of the sand. Tibidabo – Barcelona also has another vantage point other than Montjuic, and it’s the highest point in Barcelona. And in my opinion, they have the BEST panoramic views of Barcelona. There, is the beautiful Sagrat Cor Church. I’ve seen some amazing images from the top of the church (you can take an elevator for 2€, which I plan to do this year!) Alternatively, if you have kids, you can also enjoy the Tibidabo Amusement Park. I went here last year, assuming it would have cheesy rides and cheesy everything, but I was wrong! It has the most amazing views of the city. It also has vintage-style rides with a carnival feel. Highly recommended! 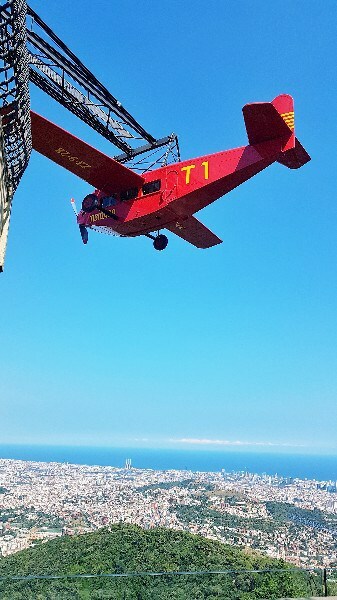 Vintage rides and the highest views – that’s Tibidabo! Gracia neighborhood. This hip little neighborhood doesn’t have any major attraction in particular. Its appeal for expats to live in this residential neighborhood is its charming squares, art galleries, and organic shops. It’s one of my favorite neighborhoods when I need some creative inspiration! I would live here if the streets weren’t so close together. MACBA and El Raval district. A stark white museum of contemporary art, Museu d’Art Contemporani de Barcelona (MACBA) sits in the middle of a large plaza where skaters like to show off their skillz. Personally, I enjoy this museum more than MNAC because of the open space and minimalist feel. It’s in the neighborhood of Raval, which is a multicultural, gritty neighborhood. It’s got vintage shops, record shops, hip bars, and trendy restaurants and is worth exploring too. A day trip outside Barcelona. If I were to recommend any day trip, my first choice is 1) Montserrat, which is an incredible mountain range that you can hike your just stroll around. They are truly breathtaking! It is very accessible by public transportation. If not, try 2) Sitges. This is the whitewashed town and a relaxing beach area. Need more ideas? 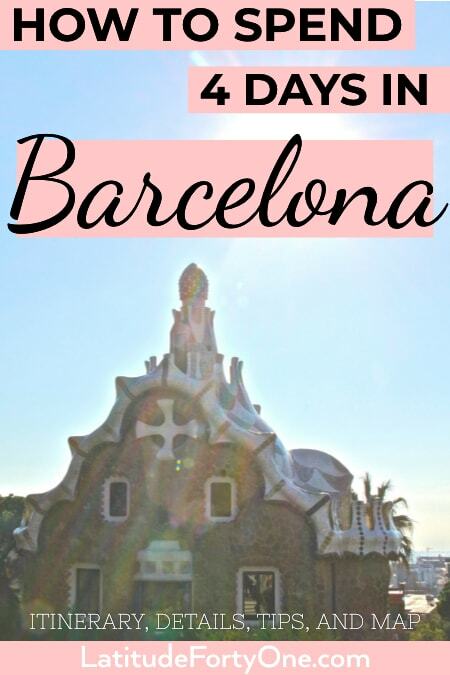 See my post on Barcelona Day trips and also get details on how to get there! Day 3) Montjuic area and the beach / port area. Day 4) Your choice! Tibidabo, Gracia, or a day trip. Or maybe go back to some place you already visited and loved! Want to see what this looks like mapped out? It looks messy right now, but click the map to get a better view. Also, see the orange icons for suggestions on where to eat! And save the map on your phone! Estimated Barcelona budget cost. I’m going to quickly guesstimate. And I’m NOT going to count your hotel stay. FOOD: You can probably spend about 5€ for a basic breakfast (toast and coffee), 15€ for lunch (menu del día), 30€ for dinner. That would be about 50€ a day for food. That number seems pretty average, so you can probably spend about 30€ to whatever crazy amount to spend. TRANSPORTATION: The most economical way to get around is to buy a T-10 transportation card, which costs 10.70€. A T-10 card has 10 trips on it. So let’s assume you use it to go to the Sagrada Familia (a round trip = 2 trips), Park Guell (a round trip = 2 trips), Montjuic (a round trip = 2 trips), and Camp Nou (a round trip = 2 trips). Then the airport (a round trip = 2 trips) to equal 10 trips, or one T-10 card. 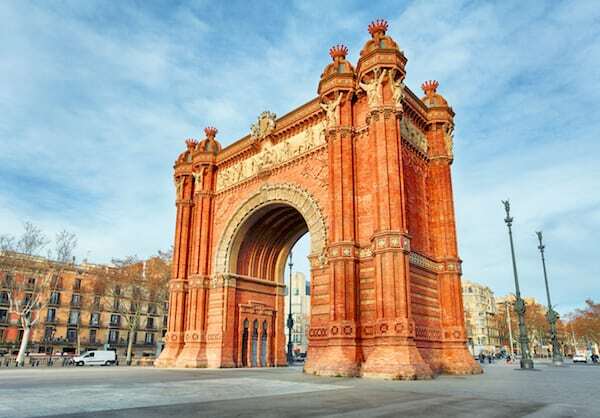 SIGHTSEEING: Let’s say you go into 4 places to visit in Barcelona, paying the minimum fee. Again here are the cheapest prices online: Sagrada Familia (17€), Park Guell (8.50€), Casa Batlló (25€), and the La Pedrera (22€). That’s 72.50€. The total for 4 days is 283.20€, or 70.80€ per day. Again, it’s an estimation. Barcelona is relatively safe. It is safe to walk around. If you’re a female solo traveler, practice the safety precautions as you would any city i.e. don’t walk around drunk, etc. I would avoid the neighborhood of Raval at night as there are some sketchy areas around. If you’re in a group, you should be fine. Yes, it’s a cool area, and yes I’ve read in Facebook groups that expats live there and nothing has ever happened to them. Other than that, watch out for pickpockets, especially on the Metro, the Sagrada Familia, and any other high-touristy area. You can drink the water from the tap. It doesn’t taste that great, but it’s drinkable. And there are many fountains around the city so that you can fill your water bottle. If you want water from a restaurant, you’ll have to order a bottle. The local language is Catalan, although Spanish (also called castellano) is widely spoken. 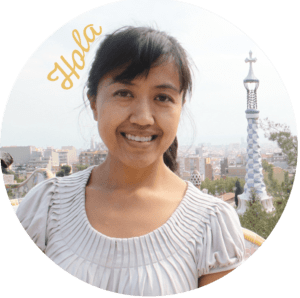 “Hola” is in both languages. “Adeu” means good-bye, and it’s polite to say when you exit a shop, restaurant, or elevator. Barcelona is also very kid-friendly, namely when it comes to finding activities and parks. I have 3 kids to show for it! Public transportation is also easy to use with kids, but a few metro stops do NOT have elevators. Ask someone to help you with the wheels as most people are happy to help. 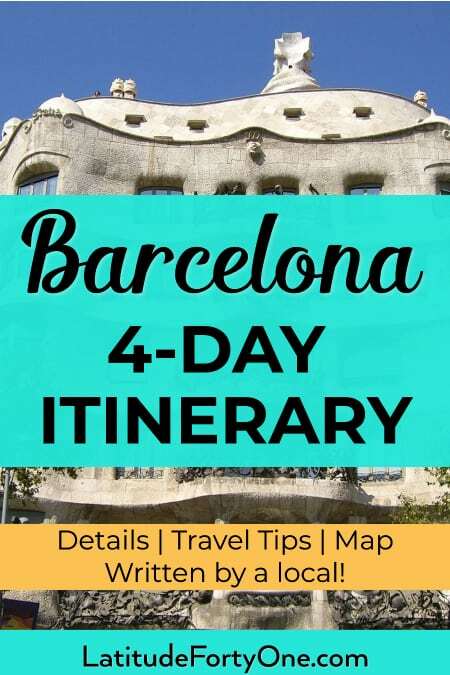 Anything else you want to know about this 4-day Barcelona itinerary? Don’t be shy, and let me know in the comments below. I read all of them!